IAMBRIGITTE : MMU sampling again??? i know...i know.it's been quite a while since i last ordered mineral makeup online. I think the last one was from Beauty from the Earth? I ordered their 20-pc sampler set because i got enabled by a few bloggers who featured the brand. I like all the colors i got and if only i don't have lots of samples to play with...i would've gotten more. i then promised myself to stop my mmu sampling. I've ordered samples of their foundations in Atlantic Bisque, Ivory chinook, Soft Wheat, Golden Harvest and Sunkissed Canadian. I just hope i'd be able to find a match. 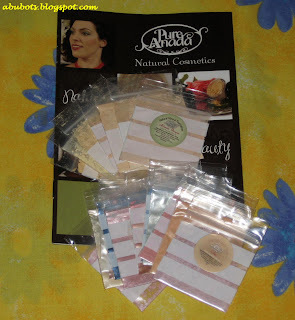 I can't wait to try my samples...woot! Hi, I’m a longtime reader of your blog. Just wanted to know how long it took before your PA order arrived? Mine has not yet arrived after almost one month already!